YANGON, Myanmar – Myanmar’s Biggest Coffee, Tea & Sweets Festival, which will take place on 1-4 May 2019, at the Myanmar Expo in Yangon, will be the ideal platform for coffee, teas and dessert lovers to come together to appreciate the best in coffee, teas and sweets as well as to learn the latest trends in the industry. The 1st edition of Myanmar’s largest Coffee, Teas & Sweets Festival unites all the coffee, teas and dessert lovers from top class baristas to talented local artisan roasters to independent coffee houses and local bakeries. It is the week of coffee for meeting coffee people, getting caffeine fix pairing up with pastries and finest tea and indulge and end with a sweetness weekend. Myanmar’s has seen a growing number of café businesses over the years. Lifestyle factor converge to make the coffee industry strong at all times . The global coffee market continues to show a steady growth and strong demand from around Asia will constitute 50% of global coffee consumption by 2020. Throughout the event, there will be great offers including promotion and discounts, free gifts and free tastings. 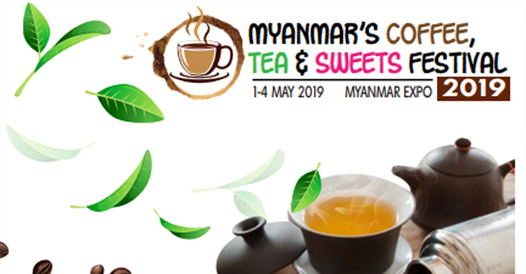 Myanmar Coffee, Teas & Sweets 2019 will showcase the biggest ever variety of coffee products, coffee machineries & equipments, tea leaves, water filtration, refrigeration, carbonated beverages, raw materials, coffee beans, chocolates, ice cream, POS system, dessert supplies, cakes & pastries, yogurts, licensing and franchising, bakery ingredients, kitchen equipment, and much more – right here in Yangon. The 4 days festival will attracts more than 10,000 public visitors to attend various workshops, competitions, coffee sharing and many exciting line up events.